The Shangri-La Hotel Singapore is the epitome of high class Asian hospitality, having been voted one of the best hotels in the world. Proudly towering in a 15 acre sea of lush, tropical manicured gardens, it offers a tranquil oasis in the heart of the city. 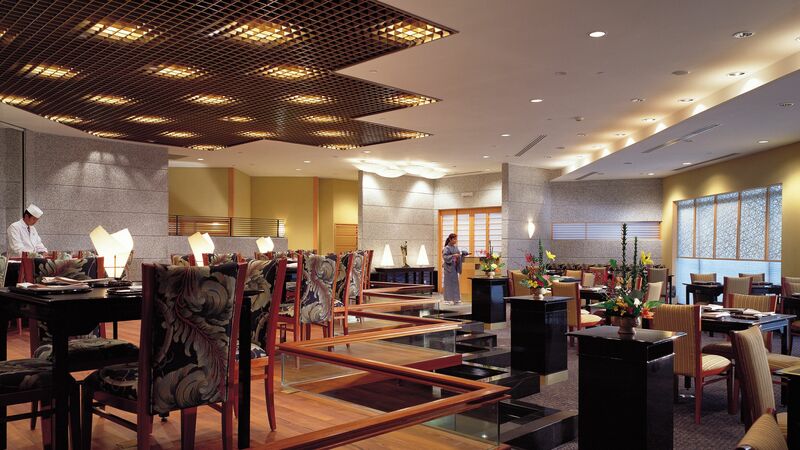 While the hotel is decades old, the décor is chic and contemporary with a subtle Asian touch. With eye catching art by world renowned artists lining the walls, luxurious furniture and modern finishes, the air of sophistication is almost palpable. Featuring several incredible restaurants, endless extra touches and boasting a list of awards as long as the incredible silkscreen tapestry in the lobby, it's the ideal place to relax in style. Hotel child prices apply to ages 6-11 years. The hotel has 747 rooms and suites across 3 wings. Surrounded by verdant tropical gardens and nestled beside the hotel pool, this modern and elegant colonial eatery offers authentic Italian cuisine. Indulge in some fresh seafood or artisanal pasta dishes, washed down with a crisp white or full bodied red from the extensive wine list. This Japanese fine dining establishment is on the 24th floor and offers magnificent panoramic views of the modern cityscape. Expert master chefs will take you on a journey of Japanese flavour, with age old, traditional methods learnt from old masters intertwining with modern ideas to bring a refinement and flavour to your plate. Located in a Chinese style garden, allow yourself to step away from the hustle and bustle of the big city and into the tranquil surroundings of this classic Cantonese restaurant. Boasting Szechuan and Shanghainese influences on the menu, a huge variety of China’s rich culinary heritage is represented here. Be sure to try the suckling pig, Peking duck or the steamed lobster with birds nest and crab coral sauce. Part restaurant, part art installation, The Line serves a wide variety of exciting dishes that are as lively as the dining room. Food is prepared in front of you in one of the 16 open theatre kitchens. With a wide array of options spanning Asian to Western and everything in between, it’s easy to see why this hotspot is established as one of Singapore’s favourite choices for lunch and dinner. This elegant venue is an institution in the city for a high tea buffet. Enveloped in graceful decor and featuring 164 blends of tea, expertly crafted cakes and flaky pastries, there is no better place to enjoy a refined afternoon. Origin is a chic art deco style bar serving bespoke creations with ingredients that reflect the historical makeup of this great city. Featuring elements from little India, Chinatown, the Japanese and European centres amongst others, this truly is a one of a kind experience. The onsite pool provides the perfect respite from the tropical heat. Elegantly landscaped into the exotic gardens, it provides an ideal location for some peace and quiet. It comes replete with fountains and water jets, as well as tasteful lighting after dark. The ultimate purpose of tai chi is to cultivate the qi or life energy within us to flow smoothly and powerfully throughout the body. A power that this incredible unique spa aims to replicate with its opulent massages, facials and whole body treatments. 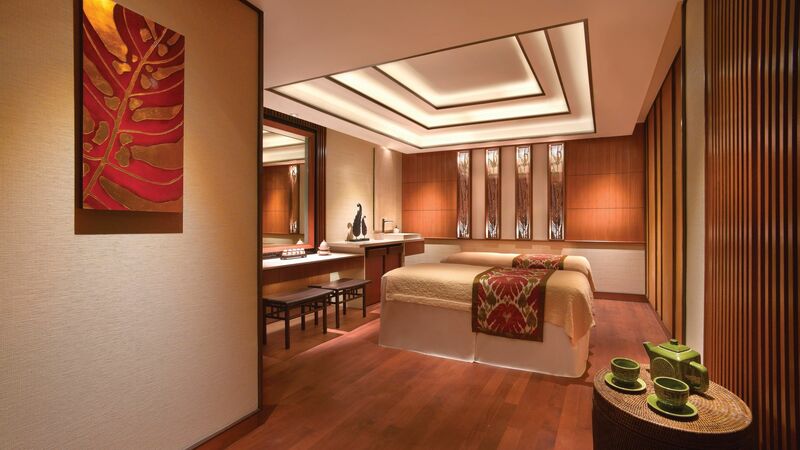 Embrace this ancient oriental methodology and revitalise and rejuvenate yourself by booking into Chi Spa during your stay. The state of the art fitness centre is exclusive to guests and boasts a full suite of cardio and free weight equipment. Unwind after a workout with a visit to the centre’s sauna, steam room or jacuzzi. Personal trainers are also based onsite to help you succeed in reaching your fitness goals. Three floodlit tennis courts (one artificial grass and two all weather) provide the perfect opportunity to refine your racquet skills and sharpen up your serves. 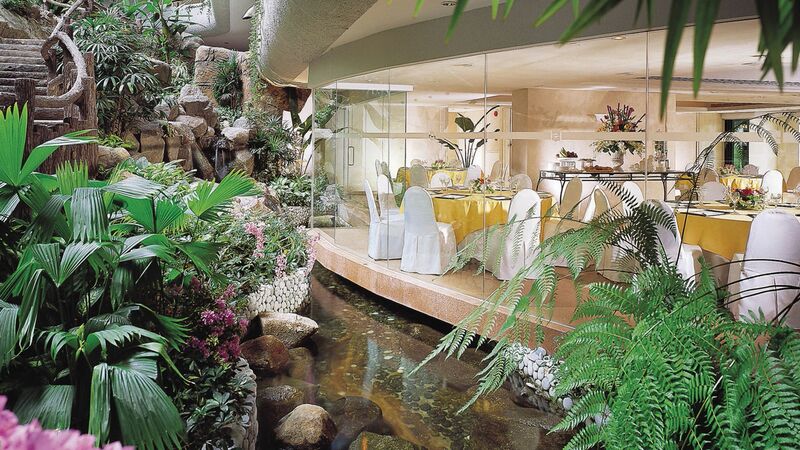 Shangri-La Hotel Singapore is a quiet oasis in the heart of Singapore’s city centre. It’s close to the many market halls and shopping malls of the city, making it the perfect place to pick up gifts, souvenirs and high end fashion. Visit the Botanic Gardens for beautiful views, or the Gardens by the Bay for futuristic structures which are home to hundreds of varieties of plants, as well as waterfalls. When it comes to dining you’ll be spoilt for choice. Try delicious local street food, with Indian and Chinese influences, or dine at the top of one of the many skyscrapers and enjoy Michelin starred meals and international options. 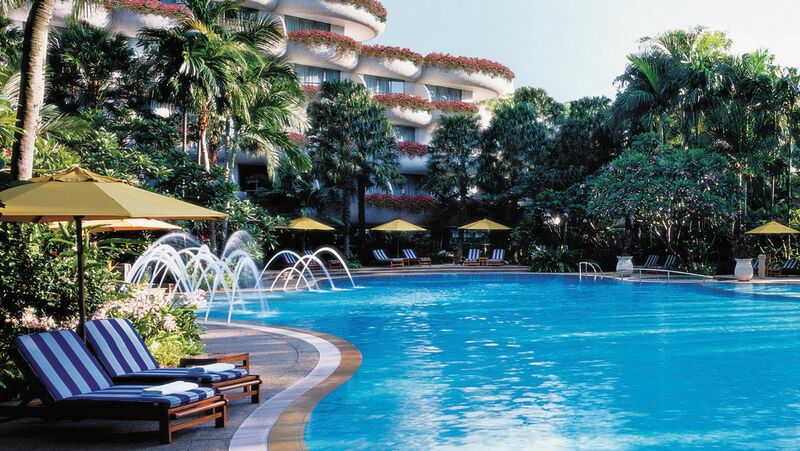 Shangri-La Hotel Singapore is a 20 minute drive from Singapore International Airport. Deluxe Tower Wing Rooms measure approximately 38m² and are decorated with stylish and contemporary interiors. Features include; satellite television, complimentary WiFi, safe, minibar, tea and coffee making facilities, Shangri-La toiletries and a separate shower and bathtub. Deluxe Tower Wing Rooms have views of either the city or pool through floor-to-ceiling windows. Deluxe Garden Wing Rooms measure approximately 50m² and are situated amongst 15 acres of tropical landscaping with nature-inspired furnishings. The rooms offer a balcony with views of the city with features that include satellite television, complimentary WiFi, safe, minibar, tea and coffee making facilities, Shangri-La toiletries and a separate shower and bathtub. Deluxe Garden Wing Pool View Rooms measure approximately 50m² and offer a balcony with views of the pool with features that include satellite television, complimentary WiFi, safe, minibar, tea and coffee making facilities, Shangri-La toiletries and a separate shower and bathtub. Horizon Club Deluxe Rooms measure approximately 38m² and have views of either the city or outdoor swimming pool. The room also features L'Occitane bathroom toiletries. Horizon Club benefits include; private check in/check out, dedicated club concierge, access to Horizon Club lounge including daily breakfast, complimentary wine, cocktails and canapés (between 17:00-20:00), beverages served all day, newspapers and magazines, suit pressing and shoe shine service. Deluxe Valley Wing Rooms measure approximately 57m² and feature luxurious interiors and furnishings. Guests receive complimentary Champagne, wine, juices and canapés at the Champagne Bar and complimentary breakfast in the private Summit Room. Deluxe Valley Wing Rooms also boast a complimentary minibar (excluding alcoholic beverages and snacks), a pillow menu, premium L'Occitane bathroom toiletries and bathroom mood lighting and a television facing the bathtub. These rooms are perfect for guests travelling with young children with added extras like children's toiletries, slippers and bathrobes and amenities from the Stokke V.I.B (Very Important Baby) Programme, which includes cots, push chairs, high chairs, baby bath, baby monitor, steriliser, thermometer and nappies. Save up to 15% discount on the hotel price for holidays between 01 April - 26 December 2018 and 03 January - 31 March 2019 booked 60 days or more prior to arrival (excludes staying in a Deluxe Family Room). Honeymoon couples receive a fruit bowl, chocolates and a bottle of house wine for holidays between 01 April 2018 - 31 March 2019 (excludes staying in a Deluxe Family Room). This is a very old Shangri La property which has now undergone renovation and the room shown is one from the renovated floor. The Standard Room are decent in size compared to other new hotels in Singapore, but not large enough for a couple with child to stay in the same room as there is very little space around. The amenities are all ShangriLa standard and the quality of the Room Service is good with neat and clean sheets, bathroom and common area. Shangri La in Singapore have 2 wings and often the Guests get confused. The room reviewed is in the TOWER Wing. The rooms in Valley Wings and Garden Wings are larger. 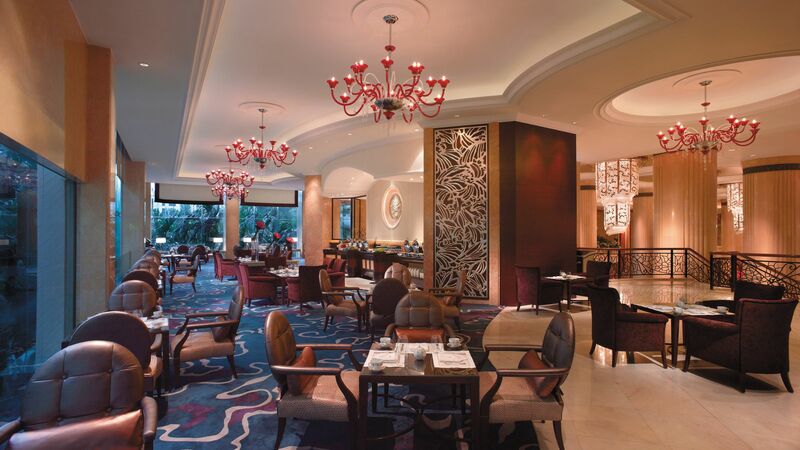 If you are a breakfast person, do not forget to take the room with breakfast as the breakfast spread in the ShangriLa THE LINE Restaurant is one of the largest buffet you can find in Singapore. A review for The Line breakfast spread is done separately. The hotel is very tourist friendly due to its location in proximity to Orchard Shopping Area. However there are no public transport available close to hotel, leaving the only way to move is by private car or taxi. The Hotel has many restaurants and suitable for Vegetarians as well. The Horizon Club Lounge is for Guests with Club room access only. If you love to drink and dine ( only for non vegetarians) at this property, then this is the right place to be. Get your room with access to lounge which may turn to be cheaper for a family of two. Although the service is excellent, sometime i found the front desk staff trying to be professional sounding rude instead of polite. This was not with other service staff. Probably they need to put the right people on front desk and give then training on politeness and professional etiquette. Being a Jade Member of ShangirLa Golden Circle Programme helps as Breakfast comes free. What to tell about a hotel which offers excellent services in all details. From check-in there is so much hospitality, that you never will check-out. The room on Horizon Club floor was very good, and also breakfast was excellent...so much choice! The pool let me feel I stayed in a resort hotel...it is spacious and never gives the idea that you are dealing with a city hotel. Personnel was very friendly and issues were solved immediately...perfect! For me, this total experience is a reason to choose this hotel when visiting Singapore again. Staying with my family (2 adults 1 young child) for 1 night (second stay) Arrival Shangrila Singapore has amazing lobby. Spacious. Check in was fast but overall arrival was a little let down as I went to concierge to ask if I can drop off my stuff before my husband checking in. The guy said I think you can go there (pointing reception) because we are busy. Wow! I was carrying my daughter and had to go back and forth just to leave our stuff so we can go to the kids club first. So I went over the reception , the reception staff luckily was very helpful and took me back to the concierge and asked the same guy to assist me! The room Very high quality of furniture and comfy bed! Very well maintained room. However quite small space left since a lot of furniture in the room. Limited selection of TV channels for a 5star. Nice spacious bathroom. We had few small issues with the bath up but the staff quickly fixed it. Love the thick nice towels and complete amenities as always. The in room dining Took about 1 hour to deliver 1 burger fries and Briyani. We did order the burger first and then the briyani. Then was offered if they can deliver together. Of course. But then the fries were already cold. they already cooked it probably before the briyani done. they should have not offered for it to be delivered together with the briyani. Taste average.Not recommended. Breakfast Another disappointment. While all guests staying here I believe paying at least $280/night, we should deserve to get fresh juices served in breakfast? Not chilled juice! Huge selections of breakfast menu which I appreciate. The Swimming pool Heated! Just decent temperature perfect for kids! Unfortunately it can get very busy during weekend. It took as a while to find a sun bed. The kids club (Buds) By far the best indoor and outdoor hotel kids club in Singapore or maybe south east Asia. This is the only reason other than the room and the heated pool why I rated shangrila singapore very good! I don?? ?t mind paying extra (you need to be staying in family deluxe room to get free admission ) given the quality of the kids club. My daughter loved it, spent at least 3hours! This is probably my last staycation with Shangrila Singapore. Would only visit the kids club as an outsider. Overall I would recommend this hotel for family or group, definitely not for couple looking for tranquility. It is too busy/crowded at the lobby (so many events usually on weekends) , hard to get sun bed on weekends at the pool and very busy breakfast time. Shangri-La never disappoints and this is another instance of the team going beyond normal hotelier service to welcome and accommodate. From check-in where our 4 yr old was having a mini meltdown and calmed by a staff with a cookie and a stuffed toy to concierge and checkout. Top experience all round.